Carson MM-01 zPix Accessory Kit is the perfect companion for your zPix Digital Microscope or for any standard microscope. Includes 3 prepared slides containing insects to view under your microscope and 7 blank slides to find your own specimens to examine. 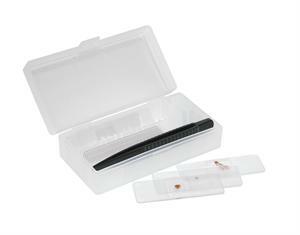 The zPix Accessory Kit also includes slide covers, tweezers and a storage case. Dimensions 4.25" x 1" x 2"